From barren wasteland once filled with trees, to the sharp transition in rain patterns, climate change continues to harm the world in a variety of ways. And Lake Mead is no exception. The evidence is right there at the chalky mineral ring circling the largest man-made reservoir in the United States. And as the Southwest feels the wrath of a drought that dries up its precious sources, Lake Mead continues to take the hit. The lake’s current elevation of 1,088.98 feet is 46 feet less than it was three years ago, and the Bureau of Reclamation expects it drop to 1,071 feet by September 2016. The main reason for Lake Mead’s continuous drop, according to several government organizations, is because the Rocky Mountains are being destroyed by climate change. 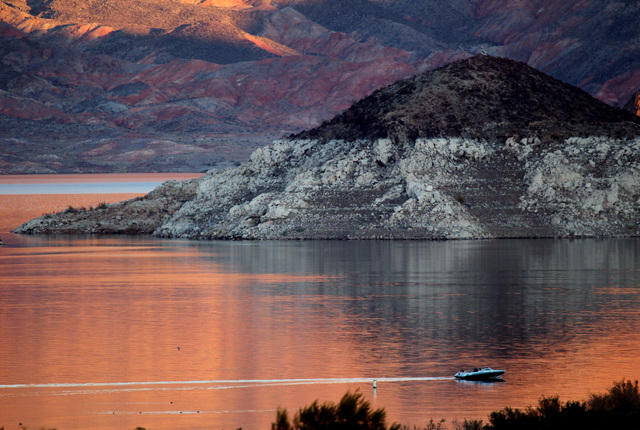 The Rocky Mountains are Lake Mead’s lifeline. As the snow melts from the mountain and makes its way through the tributaries that feed the Colorado River, a portion of accumulated water from Lake Powell is released to Lake Mead. But as temperatures continue to rise, Lake Mead will continue to drop. The change in climate has severely oscillated the amount of snowpack — and ultimately water as the snow melts — Lake Mead has received from the Rockies during the years, according to the Environmental Protection Agency. Since 2000, the percentage of snowpack by April 1 has been anything but consistent. In 2000, the snowpack from the upper Colorado River Basin was at 93 percent, according to the Natural Resources Conservation Service. That number dipped to 60 percent in 2002, but skyrocketed to 122 percent in 2005. April snowpack was only at 69 percent in 2007, but shot up to 120 percent the following year; and the 2012 snowpack of 56 percent was the lowest since 2000. As of March 27, snowpack for this year was at 74 percent. As winter temperatures continue to rise, precipitation comes down more in the form of rain as opposed to snow, according to the EPA. The rising temperatures also have caused the snow to melt earlier in the year, feeding the drier soil as it runs down the mountain. Climate change also has altered rain patterns, which has led to a severe drought in the Southwest. According to the National Park Service, the area surrounding the Colorado River received 80 percent of its average rainfall in March. That number is expected to dip to 66 percent in April, and will increase slightly to 68 percent in the summer. According to Michael Pravica, a UNLV physicist who has led several discussions on climate change, the abundance of greenhouse gases has led to the extreme change in weather patterns across the world. Water vapor, carbon dioxide and nitrogen dioxide are the biggest culprits, he said. According to NASA, the atmosphere’s carbon dioxide level has increased 100 parts per million since 1950. The atmosphere’s current carbon dioxide concentration is the highest it has been in the past 650,000 years. The Rockies, Pravica said, need condensation to cool. Condensation turns to snow, but the increase in greenhouse gases has led to less condensation, which means less snow to feed Lake Mead. But the future of the Rocky Mountains, the lifeline that keeps Lake Mead going, could be in jeopardy for years to come, according to a joint report published by the Rocky Mountain Climate Organization and the Union of Concerned Scientists. An increase in wildfires and bark beetles have devastated trees in the Rockies, and scientists project that river flows will continue to diminish in the Southern part of the mountain range, the report said. The hotter temperatures and drier climate have increased wildfires in the Rocky Mountains by an average of 18 per year, according to the report. 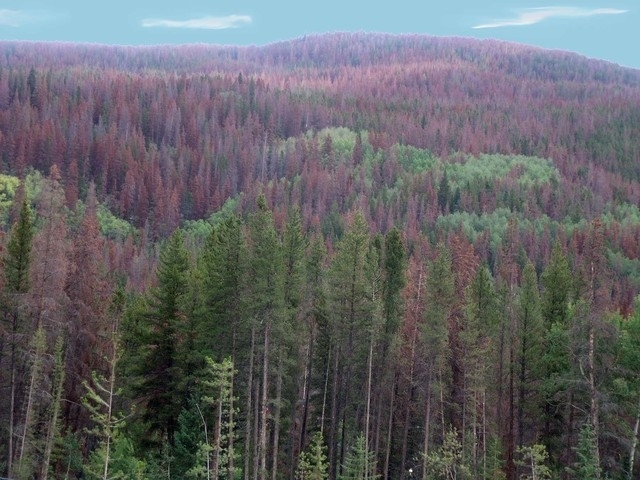 The increase in bark beetle population, according to the report, is generally affected dramatically during global warming. From 2000-12, bark beetles have killed billions of trees in the West, covering an area approximately the size of Colorado. The tiny bark beetles in the Rockies have indirectly impacted the water levels at Lake Mead as they continue to wreak havoc on trees around the park. According to Kyle Patterson, public information officer for Rocky Mountain National Park, bark beetles have done most of their damage on the west side of the park. Even though bark beetles are native to the region, Patterson said the drought conditions and warmer temperatures have led to a severe outbreak. “Rocky Mountain National Park is just one relatively small area where trees have died from the beetle epidemic,” she said. Harsher winters with cold temperatures can kill beetle eggs and larvae wintering under a tree’s outer bark, Patterson said. But warmer winter temperatures and low precipitation that has weakened trees in the Rockies have aided a vast outbreak of beetles, Patterson added. “There certainly has been past beetle outbreaks in this area, but none as bad as this most recent outbreak. It is tied to climate here in Rocky Mountain National Park,” she said. U.S. Senate Minority Leader Harry Reid, D-Nev., has tried to tackle climate change by working on legislation to help improve the country’s water infrastructure. Along with Sens. Ben Cardin, D-Md., and Barbara Boxer, D-Calif., Reid recently introduced the Water Infrastructure Resiliency and Sustainability Act. The legislation is aimed to help the EPA work with communities across the country to make improvements to their water systems. “Water has always been a precious resource in Nevada, but our limited water supplies are growing even scarcer as a result of the long-term Western drought, and it is critical we do all we can to maximize the use of water we still have,” Reid said. Reid also met with members of the Southern Nevada Water Authority and Las Vegas Valley Water District to discuss future improvements to Nevada’s water infrastructure. Reid was recently able to allocate $8.6 million for the Lower Colorado River Basin Drought Response Action Plan. Pravica stressed the importance of finding long-term solutions to climate change. The use of electric cars and alternative sources of energy will help reduce our carbon footprint, he said. But even basic actions, he added, can help make the environment safer. But Pravica said there are still obstacles to climb. Gridlock in Washington over climate change has made it difficult to address some issues, and Pravica said that’s a big problem. “It’s pretty scary how some politicians refuse to meet with scientists,” he said. “We need to let the scientists talk. We’re already seeing the effects of climate change. There are some worries about the next decade and the temperature continuing to rise. 2014 was the hottest year on record. Because of the declining water level, officials at Lake Mead are planning to spend millions of dollars to extend launch ramps this summer. An additional $700 million is being spent to add a third intake pipe to ensure an adequate supply of drinking water. And they remain at the mercy of Mother Nature, with future projections not very favorable for the lake.